A supermassive black hole powers jets of cosmic rays on either side the elliptical radio galaxy Hercules A. 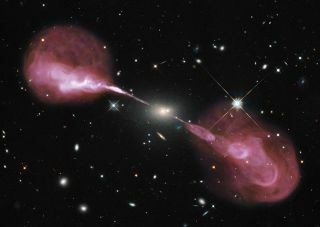 An amazing new radio image of elliptical galaxy Hercules A reveals two gigantic cosmic jets shooting from its center. The galaxy, also called 3C 348, lies some 2 billion light-years away and is the brightest known radio-emitting object in the constellation Hercules. In optical images from the Hubble Space Telescope's Wide Field Camera 3, Hercules A seems to be a quite ordinary galaxy, seen glowing, yellowish in color at the center of this image. But superimposed radio data from the Very Large Array (VLA) in New Mexico shows jets that would be invisible to the human eye, stretching out one-and-a-half million light-years across, according to NASA. Made up of high-energy plasma beams, subatomic particles and magnetic fields, these jets are powered by the gravitational energy of the galaxy's supermassive black hole. "It’s both beautiful and fascinating to look at," astronomer Stefi Baum, of the Rochester Institute of Technology, said in a statement Monday (Dec. 10). Baum and her fellow RIT researcher Chris O'Dea found unexpected differences between the Hubble images and the radio images regarding the appearance of the dust clouds and jets on the two sides of galaxy. "One side has dusty filaments of cold gas that lie along the edges of the radio jet, suggesting they have been dragged along, or entrained, by the outflowing radio plasma; but the other side of the source shows dusty filaments which resemble two bubbles,” Baum said of the Hubble data, explaining that the radio data revealed the reverse. "The side that has the dust bubbles is the side with the normal looking collimated jet and the side with what looks like more entrained dust is the side that has the very unusual bubbles in the radio," she said. "We’re perplexed so far." O'Dea said the differences between the characteristics of the cold gas and jets "supports the idea that the differences in radio properties are established on larger scales as the jets interact with their environments" while traveling outward from the galaxy. The researchers have not completed a full analysis of the radio data, which they say might help refine models predicting the radio emissions from the galaxy.